Many of the reporting options discussed so far center around ensuring the effective and efficient operations of a company’s business processes. The information system supporting the BR process can play an important role in the development of a company’s strategic plan in addition to monitoring ongoing operations to measure attainment of the plan. This section discusses the upfront and ongoing assistance that the strategic planner obtains from the information system. During the strategic planning process, data from the entity-wide database or datawarehouse can be compared to data about the competition to determine an organization’s relative strengths and weaknesses. For example, these data might include sales trends, gross margin on sales, age of capital assets, skills of existing personnel, and so on. These data can be presented in reports from the existing IS applications, such as sales/marketing, human resources management, fixed assets, finance and inventory, or via the OLAP models incorporated in the BI system. 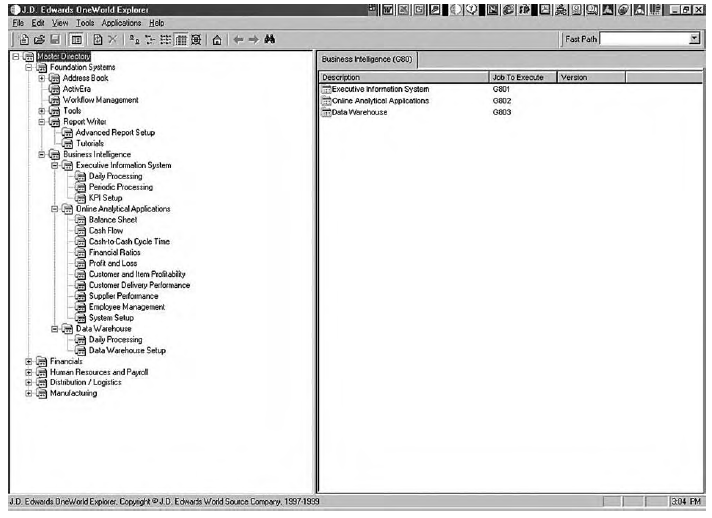 Recall from Business Intelligence and Knowledge Management Systems that data from the environment can also be incorporated into the BI system output. Strategic planners can combine environmental data with those obtained internally to assess the organization’s competitive position. In addition to assisting in the planning phase, the IS can be used to follow up by reporting certain key performance indicators that illustrate the status of processes and critical success factors. For example, the number of customers along with the level of sales and number of customer complaints for each should indicate the status of an organization’s sales network. Other key performance indicators might be the number of new products, the cost to manufacture the products, and their selling price. If the data warehouse is developed in light of the strategic plan, many of the data for the key performance indicators should be readily available. Clearly, business intelligence tools are invaluable for companies like FW Murphy (discussed at the beginning of the chapter) as they work to manage relationships with key customers like Caterpillar. How is business intelligence used to support strategic planning?